Pitmaster Jimmy Hagood handed me this bottle of sauce, prominently branded as "Big Apple Barbecue Block Party Special Reserve," while in the midst of showboating his pulled pork skills. 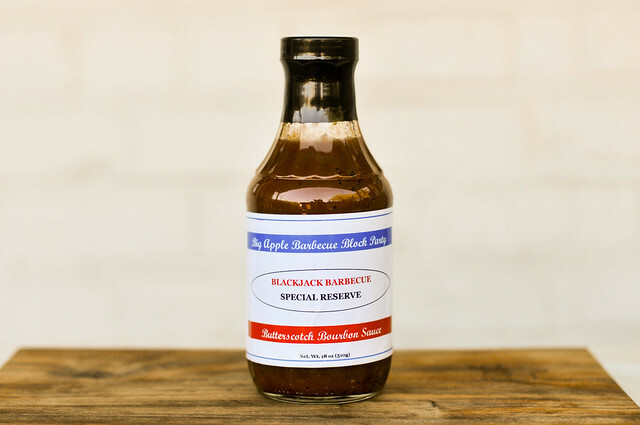 The label led me to believe I was bearing something special—a sauce available to the select few who venture into conversation with this pitmaster during this once a year event. It didn't take long to dispel that, as I found it for sale at the BBQ Pro Shop. Never-the-less, it's not in the usual listing on Jimmy Hagood's specialty food business, so I still feel a little special. The Blackjack Barbecue cooking team hail from Charleston, South Carolina, where Jimmy Hagood started his career as a pitmaster in 2002. 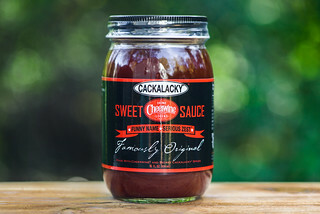 Since then his team has gone on to win numerous awards, including one for his mustard sauce, and are regulars at food festivals around the country Under the moniker Food for the Southern Soul, he sells three different sauces online: a red sauce, mustard, and vinegar, representing the diversity of sauces that define the Carolinas. 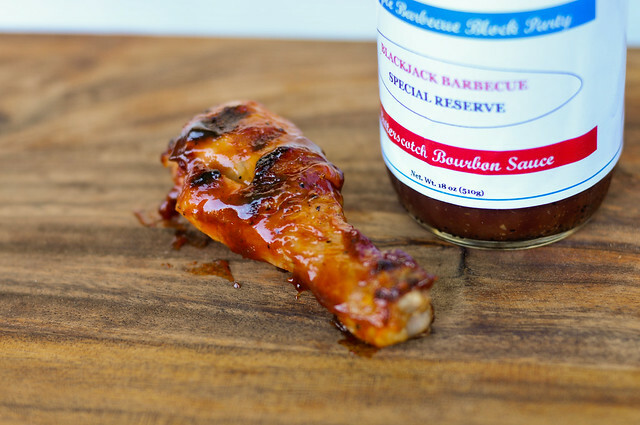 With one whiff, there's no doubt this sauce is heavy on the bourbon. Once getting beyond that, the distinct tomato and sweetness of ketchup plays equally against the aroma of vinegar. This sauce runs thin and drizzly. The thinness makes it easy to see the specks of pepper and other spices, which are felt only slightly on the tongue in an otherwise very smooth sauce. The bourbon that was heavy in the aroma department is put into check in the overall flavor of the sauce. A sweetness that seems to stem more from ketchup than butterscotch is cut with vinegar, which both mix equally with the bourbon. The black pepper and mustard finish off the sauce with just the slightest spice. 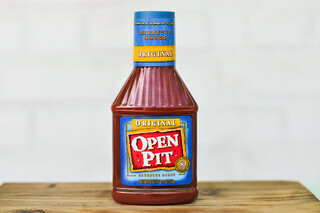 All in all, this sauce has a great balance of flavors out of the jar. After being cooked, the bourbon flavor start to wane, giving the butterscotch more of chance to come out, but the sweetness still tasted mostly of ketchup. The vinegar was still there to add some tartness, keeping the sauce from getting overly sweet. Being thin, extra bastings were needed to fully coat the chicken to the same degree as a thicker sauce. 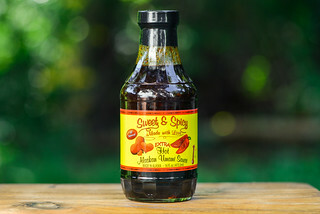 The thinness of the sauce and the excellent flavor out of the bottle makes this a great to us as a condiment or dip. 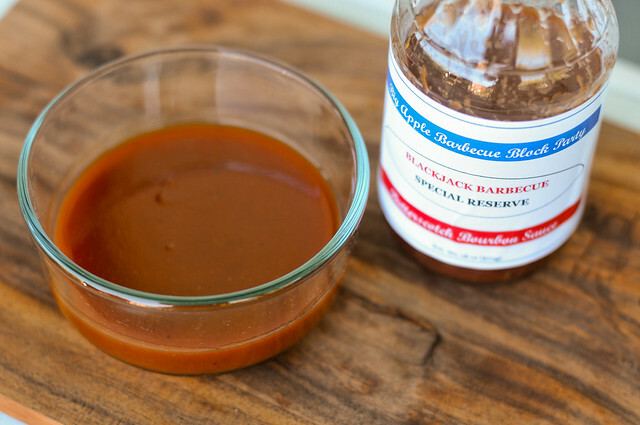 It would go especially well on a big stack of pulled pork, where some smokiness would only further enhance the flavor of the sauce, and the light tasting pork would not mask any of the good stuff going on.